Hunk of junk. I want my money back. If you live near cleveland ohio, or Detroit Michigan. It may be useful. But. If you do live there and like this kind of thing you already know the places. I was led to believe I was buying an app with a database of places across the nation. This is not the case. Pure scam. I don't pay money to view adverts. App removed from my phone. There are so many other ways to make money on the iOS platform. Charging for an app and then displaying unrelated adds is a VERY bad idea. I wouldn't be complaining / rating poorly if one of the screen shots showed an ad. I feel cheated. It shows you the locations and the videos, ratings, comments and how to get there. The app works great!!! I, too was excited about this ap. I work for an airline and was looking forward to finding DDDs all over the country. But it kicks you out as soon as you try to use it. Wish the Food network would launch an ap for DDD! I would happily pay for it. Yep, after the update. Does not load. I have re-booted iphone...still does not work. Tried searching for locations in Annapolis, MD. Search returned error 500, even though the listing by state did show several locations in Annapolis. 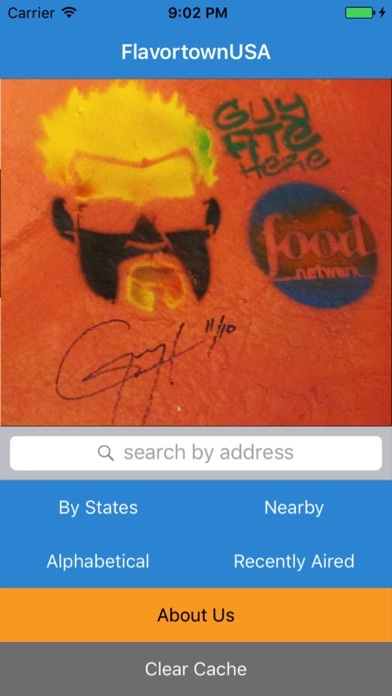 App is recommended by the Flavortown web site, notwithstanding the disclaimer. Would be nice if they fixed their search bugs. I like this app so far because it has more current shows displayed than the TV Food Map app. I wish there was an area to check off that I've been to the location. I like to keep track of which ones I visited. I live in Connecticut and it shows plenty of places near where I live. Works fine! If you charge for an app you better keep up with it. This doesn't work anymore. Will not even open. I was looking so forward to this app. Love the idea of this app and it worked great for me. I would give you a 5 if you actually put what Guy ate during his visit to the restaurants in the description. After all, isnt that why we visit these places? I watch a lot of DDD but can't remember the specialty items of each joint. 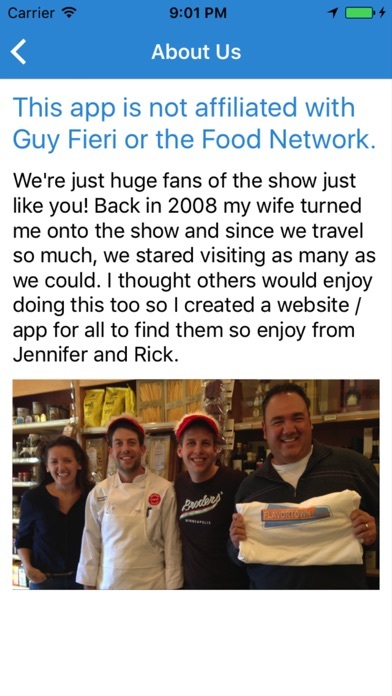 Love the show and the app idea, but it just doesn't work. Error message is all I get. Bummer. 5 stars all the way!! Directions, phone numbers, menus, you tube links!! Awesome!!! 5 stars all the way!!!! I was nervous downloading the app after reading all the reviews, but it was only $.99, so I took a chance and downloaded it and it works wonderfully! App looks great but after I bought it. It just stays in the cloud so it's useless. App no longer works. Was fine before but now just shuts down when you try to open it. :-( was great while it lasted. 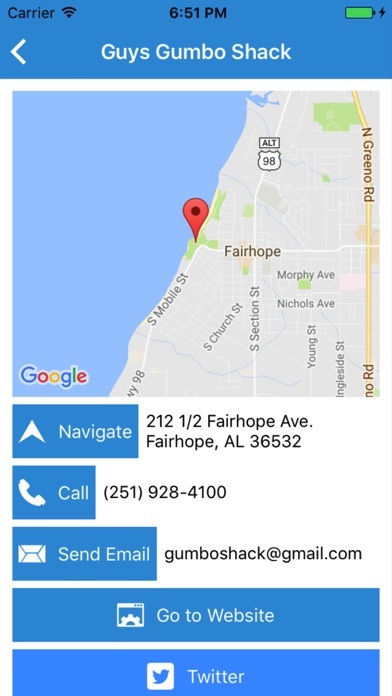 Repeats the same listings no matter zip codes you enter. Misrepresents DDD because it does not list all the places Guy has been to. Wasted my money buying and gifting to a friend. Used this app traveling from the west coast to the east coast. 6 months later I used it traveling back. It worked great. I'm sure it has a few bugs but it's always worked the way I needed it to. Highly recommend getting it for only a buck. This app hasn't worked for me in a while...don't waste your money! App crashes upon launch ever since most recent update. Please fix it soon! There are bugs in this app that don't let you access the information. Simple app that does exactly what it advertises.. A no brainier for any triple D fan. Best dollar spent and highly recommend! 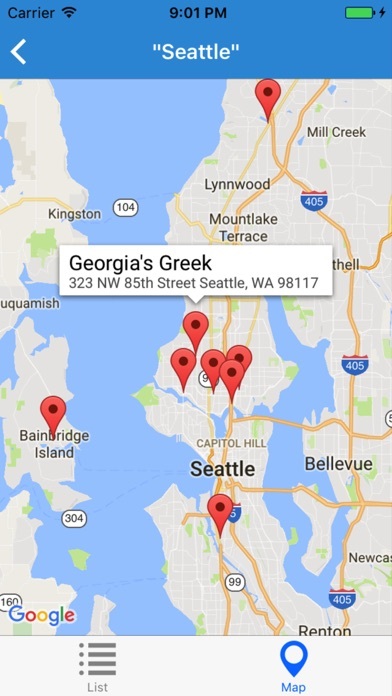 I went to five DDD places and they were all awesome and right where the app said it would be! It was so current that two of the places hadn't aired the episode yet. Well done! Don't know why all the bad reviews. It works and it's free. What more can you ask for? Live in northern Colorado. Nothing even close. Horrible! 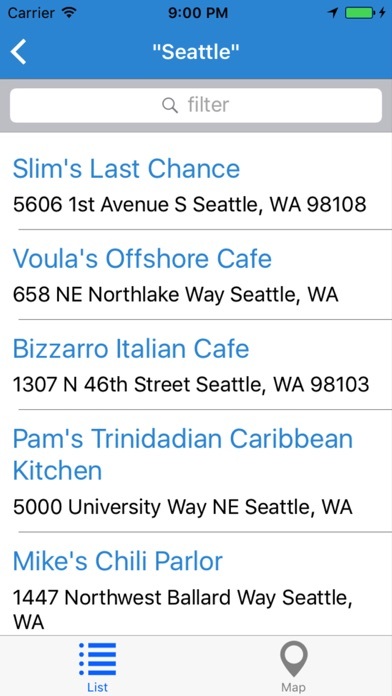 This app only list restaurants and not much more. Could be more detailed and list menus & current updates. I have been to a lot of triple d joints and some have hit it out the park and some have struck out. It would be nice if one could get a sense of how things are going at restaurant before committing to it. In this case, they charge for the app. What are we paying for? Could get this info for free? Time to step it up flavor town. Works like a charm for me, well worth a buck! Love the show, hate the app. Error message when trying to retrieve additional information about the locations. The website is free and offers better info. App doesn't work. I have downloaded two times, restarted, etc and I get an error each time it comes up. Junk, you can find all of this on the web which is what I had to end up doing. After updating my phone, this app no longer worked. I deleted it and re-added it and now it works. The app no longer works. Too many crashes. Great idea, nice app once it works. Please fix. This app is garbage... Get on safari and google, you're better off. Too bad I read the reviews AFTER purchasing. I deleted this "crap app". This app is wonderful of you are a fan of Triple D! Going on a trip soon and would love to see this working again.